Time for a bit of motorcycling this afternoon. To be more precise, some “Wallace & Gromit” style biking into the countryside. And better still, on a 46 year old Russian “Ural” 500cc bike.. Invented by the Soviet Union in 1940 on Stalin’s orders to provide mobility to special forces.. This particular motorbike was originally provided to North Vietnam by the Russians where it served as a Police bike for much of its life. It had a crew of three and space for a detainee where I’m sitting.. It still retains a working siren, but we don’t use it much as it scares the water buffalo. It wasn’t a long trip (I wished it was – such huge fun!) 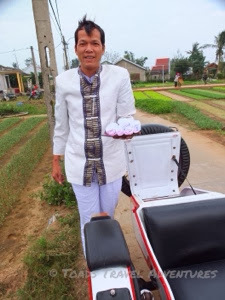 but we quickly got “off road” and I was quite surprised what we were able to cope with – as were the mountain biking tourists who must have been wondering about the mushrooms they had in their Pho for breakfast.. 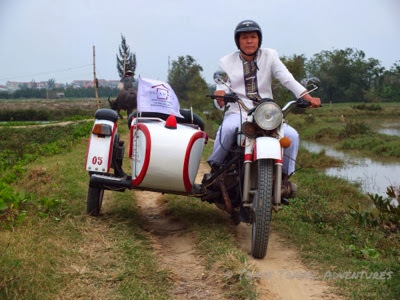 The beauty of a side car is not just comfort – but also room for a picnic! Guan, my bike buddy, batman and guide (from the hotel) was just superb. And with a sidecar you can chat as you drive along..so “Easy Rider”! We covered some mileage between farms, villages and lakes mainly on narrow paths. 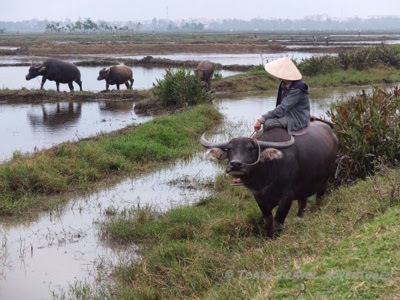 This was a side to Hoi An that I hadn’t seen before. 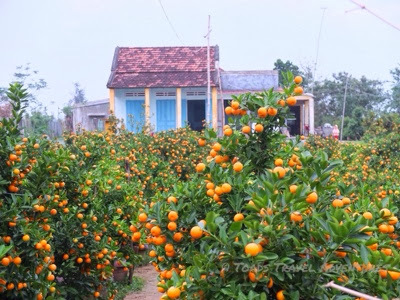 At one point Guan turned the engine off, got out and pushed – I offered to get out and help restart our aged bike, but actually he was in fact just showing respect to a local funeral ceremony we were passing in a village that grew only kumquats.. The Ural was designed for rough terrain, and we put it to the test a few times! The hotel has about six of these bikes and two mechanics who try to keep the ancient engines working. The noise and the smell make it all feel very authentic – as does the need to double declutch and kick start the bike into life. I have made a note to self to look at some longer bike trips in the future. All to soon we had to return to base..where I headed to the bar for an icy beer. I now dream of the possibility of riding a bike to Laos.